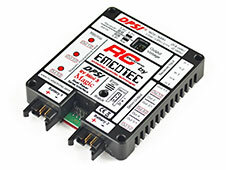 The Emcotec line of DPSI RV Mini power distribution systems provides regulated, dual redundant power supply with overload protection for each servo output and optional servo matching (Magic 5/6) for pre-assigned channels. 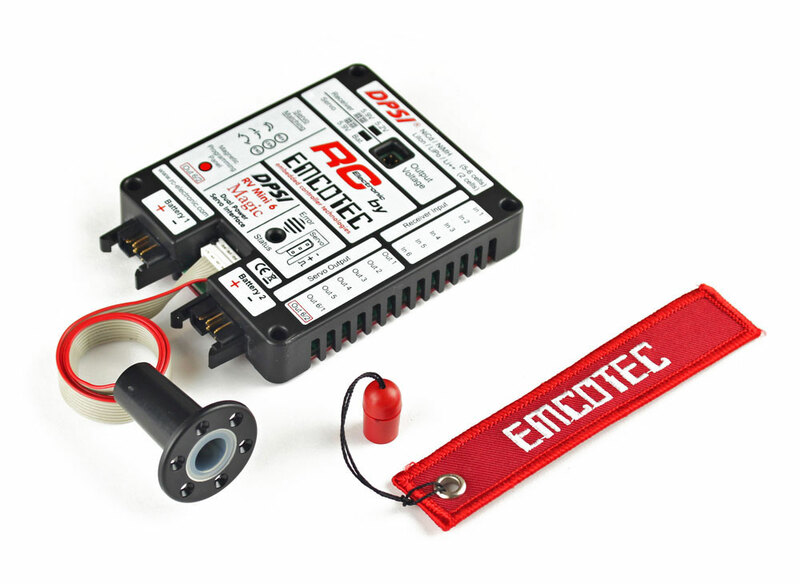 Additional advantages of RV mini systems cover high frequency interference blocking that rejects possible interference induced by long servo extensions, intelligent voltage monitoring with integrated battery status, and built-in back flow "Dynamo Effect" current protection for brushless and high power servos. RV Mini systems are highly recommended for medium size (30cc-50cc) model airplanes and sailplanes. 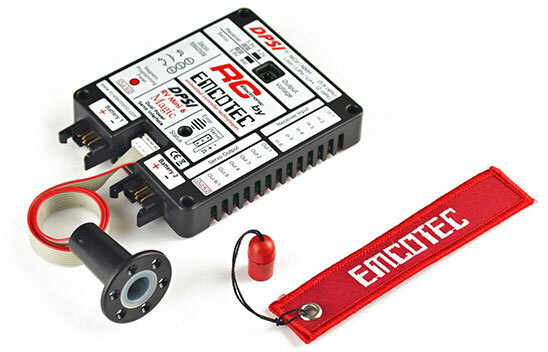 Dual built-in, voltage selectable (5.2, 5.9V) regulators supply power directly to servos and receiver independently of each other. 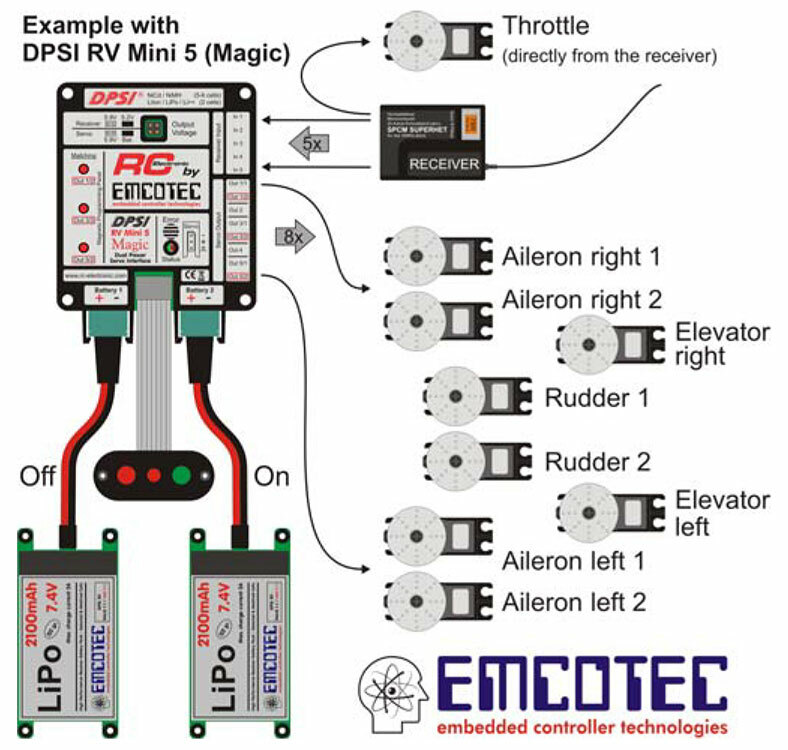 This configuration allows you to supply different voltages to the receiver and directly connected servos (throttle) and different to the servo outputs (5.9V) or direct unregulated 7.4V from your 2S Li-poly battery packs. 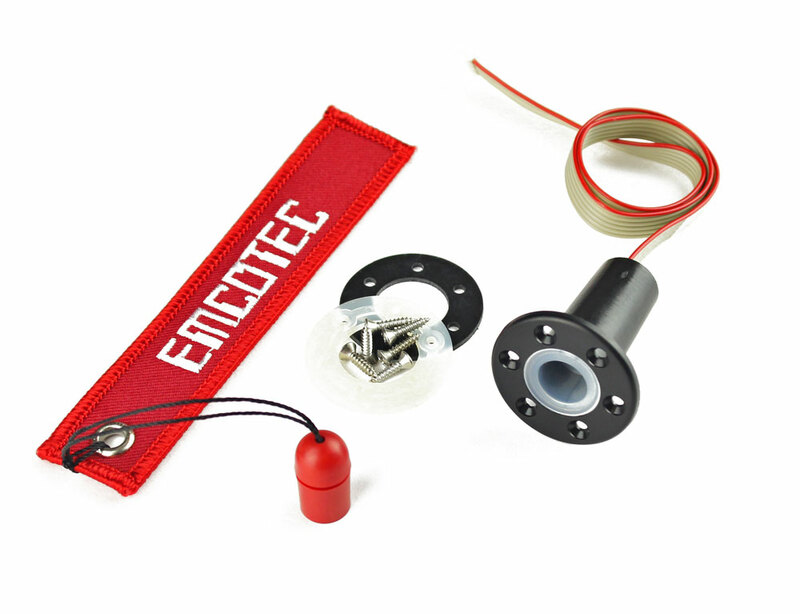 The purpose of servo matching is to adjust the center point, end-points and direction of rotation very accurately for each servo. 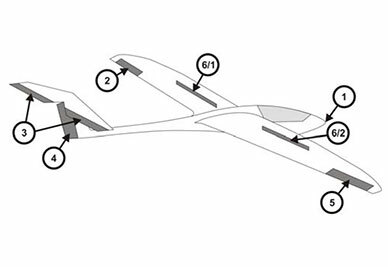 This means that multiple servos connected mechanically to a single control surface can be fine-tuned to operate exactly in parallel, preventing servos working against each other. Servo matching also allows functions to be linked, avoiding the need for two channels at the transmitter. 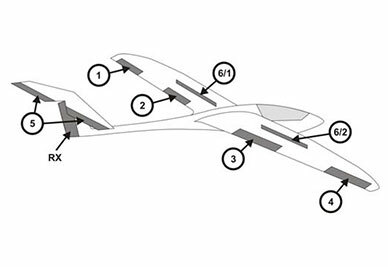 Example: the left and right flaps can be operated using just one transmitter channel, as the direction of rotation and the servo end-points are adjusted at the RV Mini 5/6 Magic. This saves channels, and in many cases makes the transmitter programming procedure much easier. Two power batteries for power redundancy can be connected to the DPSI RV Mini using MPX connectors. During use, the power is actually supplied from the battery with the higher voltage. If the voltage is the same, the power is being used equally from both batteries and allow sharing the current load. When the voltage of the batteries is different, the power is not shared and each pack is isolated from the other. 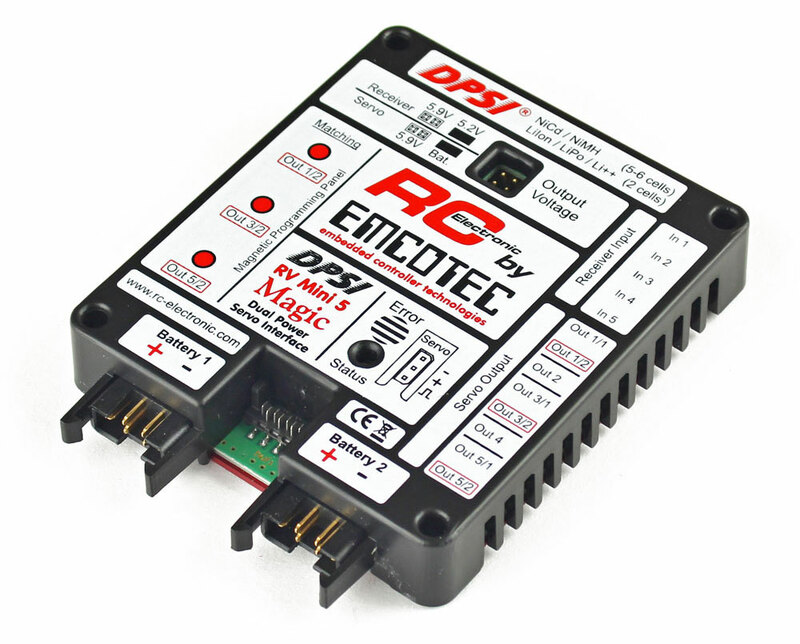 Emcotec DPSI RV Mini power distribution units are designed to operate with included Fuel Cap magnetic remote switch actuator or specially designed Magnetic Switch or Magnetic Switch PCB actuators. The switches are fail proof and they are controlled by a self-locking circuitry. This means that DPSI RV Mini stays turned ON, even if the switch fails. The logic for turning OFF is also redundant, simple malfunction cannot cause the power supply to be turned OFF. Example of DPSI RV Mini 6 Power Distribution 6/7 Channel System with possible Servo Matching (Magic 6) for channel 6/1 and 6/2 (Sailplane Spoilers or Dual Rudder Servos).